It’s almost time to pack my bag. I leave here March 4 and then fly out of Auckland on March 5. That day will last an extra 18 hours or so. 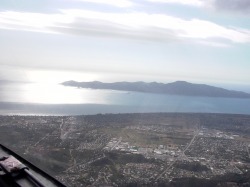 Here are a few shots I made flying a PW 5 in Paraparaumu. The lift was good, but the clouds barely cleared the hill. It was a repetitive exercise; center the lift, two minutes later – leave the lift, head to another cloud and do the same thing all over. But the view is great. 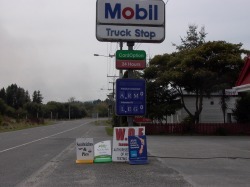 The other photo, by the most candid merchant on the South Island, is real, not a Photoshop creation. At over $6.00 a gallon, gas really does cost an arm or a leg.